Thousands of Thai opposition protesters marched through Bangkok on Sunday to demand the prime minister step down, in a “warm-up” for their planned occupation of the city. 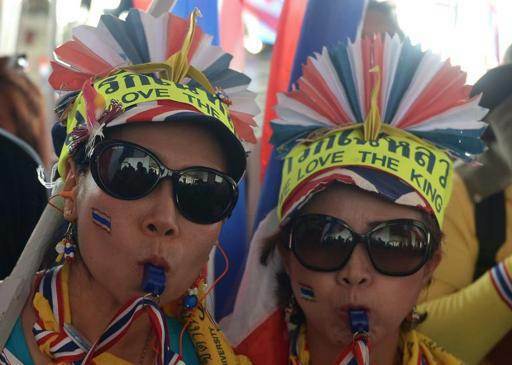 The demonstrators, who are seeking to curb the political dominance of prime minister Yingluck Shinawatra’s billionaire family, say they will “shut down” Bangkok from January 13. They have vowed to set up protest stages around the capital, prevent government officials from going to work and to cut off power and water to government offices as well as to the residences of the prime minister and her cabinet. Yingluck has called elections for February but the protesters have vowed to block the vote, which they fear will only return the Shinawatra clan to power. The protesters marched through the city’s historic district on Sunday in an attempt to build support for the occupation attempt, with similar action planned for Tuesday and Thursday. “It is our first march of the year to kick things off for the shut down,” said a spokeswoman for the anti-government movement, Anchalee Paireerak. Thailand has been periodically convulsed by political bloodshed since Yingluck’s older brother Thaksin Shinawatra was overthrown by royalist generals in a coup in 2006. The protesters, who largely comprise southerners, royalists, middle class Thais and urban elite, accuse the billionaire tycoon-turned-politician of corruption and say he controls his sister’s government from his self-exile in Dubai. They want an unelected “people’s council” to run the country to oversee loosely-defined reforms – such as an end to alleged “vote buying”- before new elections are held in around a year to 18 months. Thai stocks and the baht currency have fallen sharply on concerns that the deepening crisis will scare off foreign tourists and international investment. Eight people have already been killed and about 400 wounded in several outbreaks of street violence in recent weeks. Yingluck’s government still enjoys strong support in the northern half of the country and is expected to win the election if it goes ahead.